Last weekend, the Five Nights at Freddy's 3 page on Steam had a new announcement from its creator, Scott Cawthon. "Game Cancelled! ", the post said. " Cawthon said that he had been hacked, and that someone released Five Nights at Freddy's 3 ahead of time, on a different website. That might sound easy, but this game is Flappy Bird type hard. 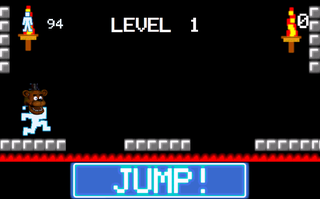 It's not uncommon to die almost instantly as you get out of the first level, and rapidly dwindle the 100 lives available to you. "Best" of all, the trollolol song plays throughout the entire game. The game is enraging, and I couldn't help but become obsessed with beating it, or at least getting a higher score. In that way, it reminds me a hell of a lot of games like Swing Copters: it's a masochistic game in which you won't get very far, and that's exactly what keeps you playing. 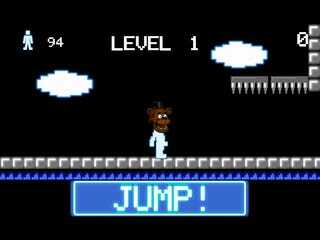 It's a silly, short game that rips off one Cawthon's earlier games, called There Is No Pause Button!. I haven't been able to get past level 3. And even though I can't remember cursing at a game so much in a long time, I think it's pretty good! I can see Cawthon releasing the game on mobile and it making a killing based on name alone. You can play the troll Five Nights game here.